Canadian Cyclist was the only Canadian publication invited to attend a factory tour last fall in Taiwan, hosted by TAITRA, the Taiwan External Trade Development Council. TAITRA administers the Taipei Cycle show, the third largest bike industry show in the world (after Eurobike and Interbike), and the largest for manufacturers (Eurobike and Interbike are mainly for retailers). Twenty-two members of the media from 15 countries in North and South America, Europe and Asia had a unique opportunity to visit some of the companies and meet with individuals who design and manufacture many (if not most) of the bicycles, parts and accessories that you ride. Below, we have links to articles and photos from the factories visited, but first an overview of how important Taiwan is in the bicycle industry. When I first became involved with the industry side of cycling, Taiwan was primarily a manufacturer of low end bikes, mostly for the mass market. That has changed completely, and now Taiwan is the number one manufacturer in the world for carbon composite bikes, and has moved from mass market (which has gone to China, Vietnam and other low cost producers) to the Specialty Bicycle Retailer market. These days, there is a good chance that your bike may have been designed in the U.S., Canada or Europe, but manufacturered in Taiwan. The Taiwanese bike industry has moved from being an OEM (Original Equipment Manufacturer, producing other companies' products for them) to OBM (Own Brand Manufacturer) and, most recently, to ODM - Original Design and Manufacturer. This latter category means that not only are they making products under both their own names and those of clients, but they are now, in many cases, designing those products. The transition is a textbook example of an economy and society transforming itself - when I first visited Taiwan some 20 years ago, the levels of pollution and safety standards were certainly subpar to those which we would expect to see in North America or Europe. On this trip, we visited production facilities with Clean Room manufacturing, state-of-the-art 5-axis CNC machining capabilities and in-house design studios. The other significant shift is the market the Taiwanese bike industry now serves. The Taiwan Bicycle Exporters Association (TBEA) says that now almost all the bicycles produced by their members are for the IBD (Independent Bicycle Dealer) market, and almost none go to the Mass market. 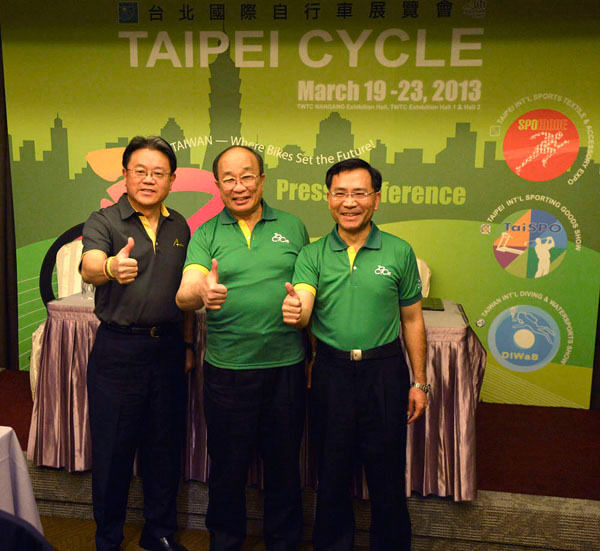 "Taiwan has become the supplier to the world for Specialty Bicycle Retailers," said Mr Michael Tseng, Executive Director of TBEA. In 2011, Taiwan had bicycle sales of $1.766 billion (US), including parts and accessories -a 10% increase from the previous year - and keep in mind that this is wholesale (FOB Taiwan), meaning that we are looking at an estimated $3 billion at retail. It should be noted that these are just bicycles manufactured and exported from Taiwan; if we include the value of products made at Taiwanese offshore factories in mainland China and other locations, the numbers are significantly higher for Taiwanese-based companies - the largest manufacturer, Giant, alone produced over five million bikes in 2010, and had revenues of over $1.4 billion (US). For 2012, TBEA was forecasting a 6.3% increase in dollar sales (with a slight decline in unit sales, as they moved to higher quality production). Taiwan has very much become the hub of the bicycle manufacturing industry - both for components and complete bicycles, as you will see in the following company profiles. We wish to thank TAITRA and the Taiwanese bike companies that opened their doors to us for making this report possible.